Kerry Callaghan Holroyde is a Northampton High School junior who enjoys spending time with friends during runs with her high school cross country teammates, and expresses her passion and love for music through playing the saxophone. 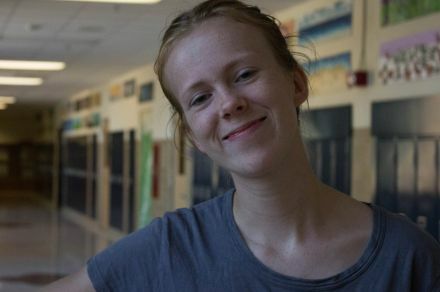 Though many students at NHS are part of a family brood, Holroyde is the first and last of her family to attend the school. As she has gotten older, Holroyde has come to accept the fact that she doesn’t have siblings and knows that it is something that can’t be changed. About having no brother or sister, Holroyde said, “sometimes there are times that I wish I could talk to [a sibling] about problems.” And Holroyde added, siblings are good for “advice about issues that I can’t come to my parents with or that involve my parents,” she said. Another downfall that Holroyde said comes with having no siblings is the fact that her kids will never have any aunts, uncles, or cousins on her side of the family. However, being an only child isn’t always something negative in Holroyde’s life. She is very close and has a special relationship with her parents. “I have as much say as them in the family which has caused me to be pretty mature and responsible,” she said.